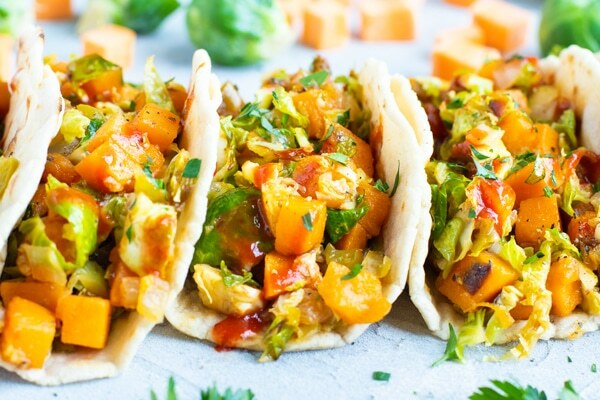 Vegan Tacos are loaded with sweet potatoes, shaved Brussel sprouts, a spicy-sweet sauce, and then wrapped in a Paleo tortilla. This gluten-free, dairy-free, Paleo, and vegan taco recipe will make you completely forget the meat is missing! These vegan tacos are hands down one of the best concoction recipes I have made to date. Not knowing exactly what to put inside these Cassava Flour Tortillas, I opened the refrigerator and spotted a pound of Brussel sprouts sitting next to a few sweet potatoes. Patience was not a virtue for me that night, so I whipped out my trusty ceramic skillet, shredded the sprouts so they would soften faster, and cooked up some Skillet Brussel Sprouts and Sweet Potatoes. This would normally be a great side dish all on it’s own, but what would it taste like as a vegan taco recipe?! Cohl and I are not strictly vegan by any means. However, having a meal or two per day without any meat, and instead LOADED with veggies!, is actually great for your body. Do you eat a vegan or vegetarian breakfast, lunch, or dinner once a day? Not only does switching out one meal decrease the amount of meat you consume per day, but it also shifts your focus from thinking meat has to be the main course. How Much Protein Per Day Do You Need? Calculating exactly how much protein your body needs per day can be a tricky task, and can vary depending on your weight, body type, exercise level, and age. So while only a doctor or nutritionist can recommend an exact amount of protein based on your personal needs, we can look at the average. Did you know that we only need an estimated 0.36 grams per pound of body weight?? That’s 54 grams of protein per day for a 150-pound person. And did you know a 4-ounce chicken breasts has about 25 grams of protein? 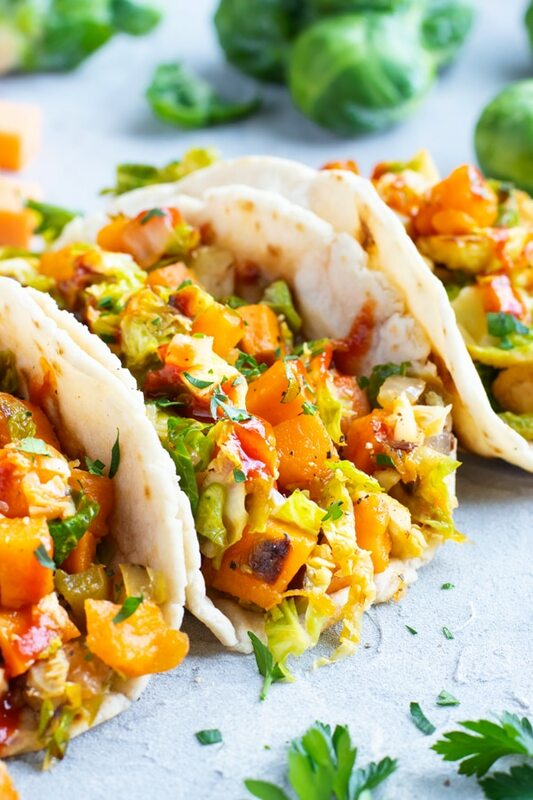 OK, so now that I have convinced a few of you to skip the meat and enjoy some sweet potato tacos instead, let’s take a look at how to make this vegan taco recipe! 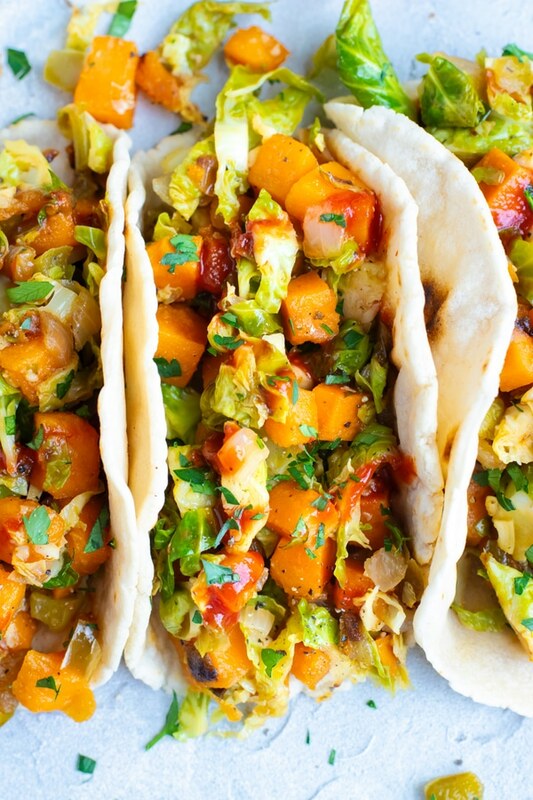 How to Make Sweet Potato Tacos? For this recipe you can either buy vegan, Paleo, and gluten-free flour tortillas at a grocery store, or you can make your own Cassava Flour Tortillas at home. 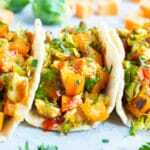 If you are going to make them at home, I would advise you to set aside a good hour to make the Paleo tortillas and your Brussel sprouts and sweet potatoes. Once you have your tortillas and veggie filling, you just need to top your vegan tacos with your favorite toppings. We like to add a bit of toasted pecans, cilantro, and sometimes a bit of radish or cabbage. 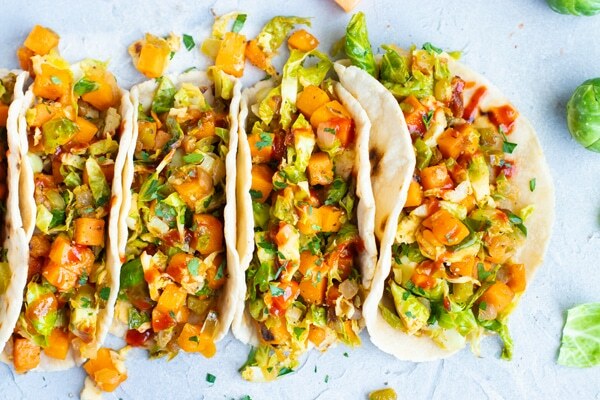 How Can You Evolve these Vegan Brussel Sprout Tacos? If you’re not in a hurry you can roast your sweet potatoes and Brussel sprouts instead of cooking them in a skillet. Make sure you just cut your sprouts in half instead of shredding them! 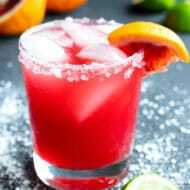 Feel free to use agave nectar or monk fruit extract instead of the maple syrup. Swap out the ground sage for rosemary or thyme. Try broccoli instead of the Brussel sprouts and butternut squash instead of the sweet potatoes. 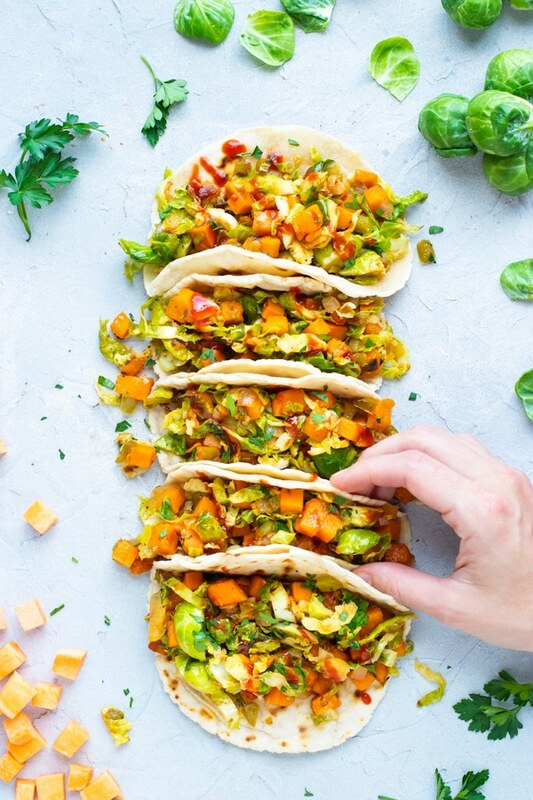 Vegan Tacos are loaded with sweet potatoes, shaved Brussel sprouts, a spicy-sweet sauce, and then wrapped in a Paleo tortilla! In a large skillet over medium heat add 2 tablespoons olive oil, onion, and bell pepper. Sauté for 2-3 minutes or until onions begin to become slightly translucent. Add additional olive oil and sweet potatoes. Sauté for 6-8 minutes. Add Brussel sprouts and cook for 3-4 minutes covered, or until Brussel sprouts are almost tender. While vegetables are cooking whisk together garlic, syrup, vinegar, sriracha sauce, salt, and ground sage in a medium-sized bowl. Add sauce to skillet, making sure to scrape the bottom of the pan to loosen up any bits. Cook for 2-3 minutes or until potatoes and sprouts are completely cooked. Serve in a cassava flour tortilla or other Paleo tortilla with pecans, dairy-free cheese, and cilantro. Enjoy! *Nutrition facts are calculated for 1 cassava flour tortilla filled with ⅛th of the Brussel sprouts and sweet potatoes and none of the optional toppings. 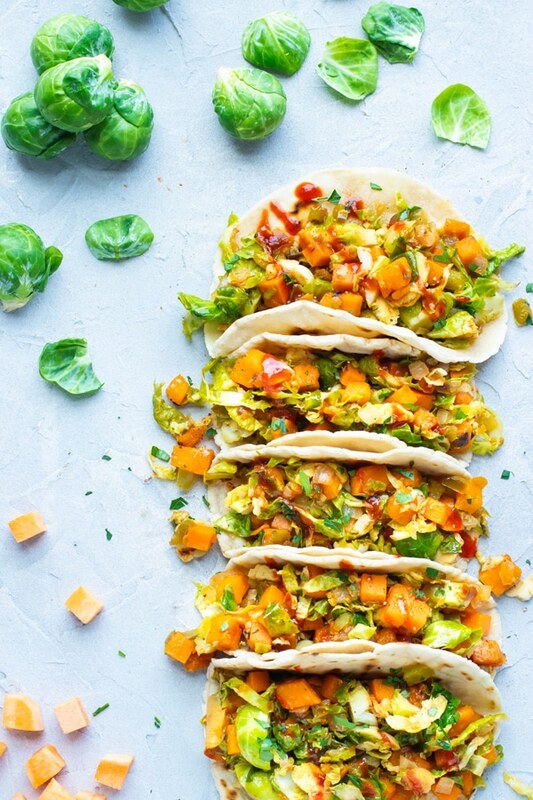 Want more recipes like these Sweet Potato Brussel Sprout Vegan Tacos? Adding these tacos to the dinner menu this week!